I initially started my cycling lessons with much trepidation although it was an ambition of mine to learn how to ride a bike. Unsure of whether at my age I’d be even able to balance on a bike, let alone ride one, I was given some confidence to join, by the fact that it was an all ladies group and run very locally at a convenient time on the weekends. 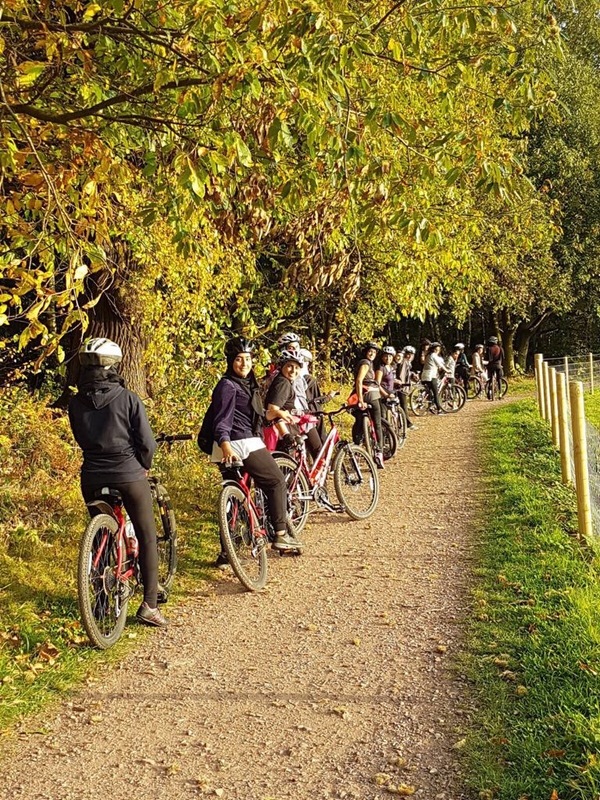 Fozia and her team were very patient and instilled confidence in all the ladies, working very well with all the different abilities within the group. It took me a while to simply just balance on the bike but when I eventually succeeded, I felt an immense sense of achievement. My confidence developed as I managed to stay on from one end of the hall to the other. More challenges came when trying to turn corners, knocking into walls, cones and into each other. Bumps and bruises galore! We started practicing outside the centre after a few months and it was a different feeling altogether. It was great to feel the fresh air on my face. Our confidence grew with great teachers who supported us with words of encouragement constantly. A few months and we were riding quite well!! When Fozia asked if we wanted to on the Greenway, we were all very nervous. Very much out of our comfort zone, riding in public. I could envisage falls and grazed knees!! We started our rides on the Greenway, learning different skills all the time. Learning when to change gears, being constantly aware of others on the Greenway and huffing and puffing uphill. And of course, there was the epic fall…war wounds!!! My confidence has grown week by week and I love the freedom I feel whilst riding. I have have had such a positive and wonderful experience whilst learning how to ride a bike. I’d say this was all down to the tutors who have supported us all throughout this journey and made it fun!! The journey that started off to learn how to ride a bike has ended up with us all making friends for life!! !